Our financial experts share their bits of knowledge on key business sector patterns and indicators. Take after the day by day specialized investigations to get an edge in trading in forex. 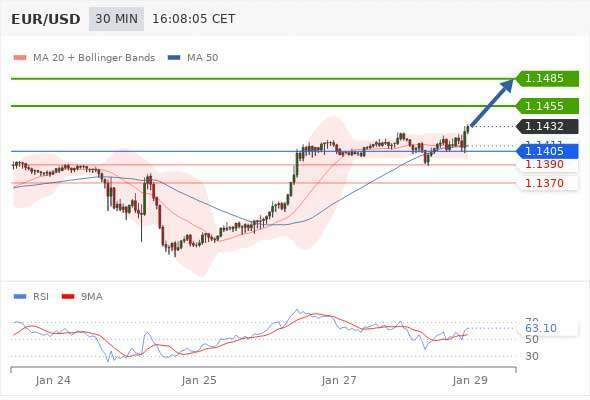 Please find the daily technical analysis and forex tips 28th January 2019. Our preference is for long positions above 1.1405 with targets at 1.1455 & 1.1485 in extension. Alternative scenario is below 1.1405 look for further downside with 1.1390 & 1.1370 as targets. Our preference is for short positions below 1.3185 with targets at 1.3135 & 1.3090 in extension. Alternative scenario is above 1.3185 look for further upside with 1.3220 & 1.3260 as targets. Our preference is for short positions below 0.9935 with targets at 0.9905 & 0.9885 in extension. Alternative scenario is above 0.9935 look for further upside with 0.9950 & 0.9975 as targets. Our preference is for short positions below 109.55 with targets at 109.10 & 108.85 in extension. Alternative scenario is above 109.55 look for further upside with 109.70 & 109.95 as targets. Our preference is for long positions above 1.3240 with targets at 1.3300 & 1.3330 in extension. Alternative scenario is below 1.3240 look for further downside with 1.3215 & 1.3200 as targets. Our preference is for short positions below 0.7190 with targets at 0.7145 & 0.7130 in extension. Alternative scenario is above 0.7190 look for further upside with 0.7205 & 0.7215 as targets.